Breakfast is a must have in this household. It's what helps start and get our day going. It's one of the first things that bring us together on the weekends when there's no school rush. One of the many products that I've come to love and use daily for my household are the bread products from Dempster's. I've been using them for years and have no complaints. They're affordable, taste great and a brand we trust. Not only do we use their bread daily, but we are also big fans of their flour tortillas and English muffins as well. Speaking of English Muffins, we were sent a few coupons from Dempster's to try a couple different varieties of their English muffins and share our favorite recipe we like to use when eating them. Their English Muffins are now softer than ever and come in three different varieties; regular, whole wheat and cinnamon raisin. 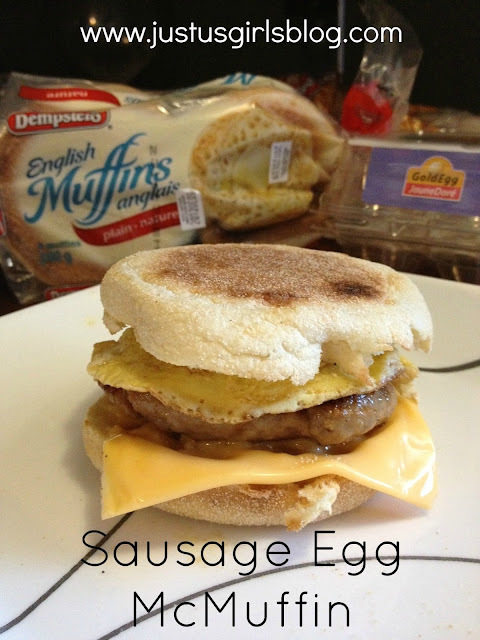 When eating their English muffins I can eat them toasted with peanut butter and jam, as a base for our mini pizzas we love to make, but best of all and my all time favorite is making them into homemade sausage and egg "Mcmuffins." So I took the recipe from Dempster's site, added my own spin on it and want to share with you my all time favorite way to eat an English muffin. Homemade just tastes so much better! Cook sausage patty as directed from the package and set aside, next put your English muffin in the toaster and as it's toasting scramble your egg. Before placing on stove-top place a circle cookie cutter (please use one that can stand the heat). Cook until done. Place cheese on English muffin followed by the sausage patty and egg. Top with other half of English muffin. Eat and enjoy! To find out more about Dempster's and their products check out their Facebook and Twitter pages. Disclosure: I am a member of the MLF Connects program. As part of my participation in this program I have received compensation, however all opinions in place and ideas on this blog are my own.